2. Where can I find Wuf Shanti videos and the TV Show? All of our videos are on this website http://wufshanti.com/videos/, as well as on YouTube https://www.youtube.com/c/WufShanti . Please subscribe to our YouTube channel. It is free to subscribe. We are also honored that the Children’s TV Network http://childrenstelevisionnetwork.com/, the in-house station at Children Hospitals across the country, are distributing our videos in their hospitals . Our videos are also on local PBS stations http://www.southfloridapbs.org/wufshanti/, BatteryPop, KidoodleTV, Adventure to Learning (in-school health and fitness programming in 25,000 schools), and can be accessed via our mindful mobile app at the links below. We hope these videos bring you joy. Thank you for joining our mission and sharing our intentions to make a positive difference in the world. 3. Can I hire Wuf Shanti for events? 4. Can I interview Wuf Shanti for my school, newpaper, magazine, podcast, radio, or TV show? 5. Will you work on charitable projects with non-profit organizations? 6. Where can I find Wuf Shanti books? We have 7 books. Each of our fictional books are centered around yogic-principles and beautiful illustrated in a cartoon-like fashion. Titles include: My Grand-dog was Yoga Instructor (the original book that started us on this magnificent journey); Wuf Shanti Makes a New Friend, Happy Birthday Wuf Shanti, Wuf Shanti and Friends Do Yoga in the Park, Wuf Shanti’s Day as a Super-Hero, and The Best Gift Ever. They can be found either on our website or Amazon. 7. How do I download the Wuf Shanti Yoga Fun Machine mindful mobile app? Our app can be download on both Apple and Android devices for free. The mobile app contains Wuf Shanti videos, as well as activities focused on being mindful and yogic, such as puzzles, matching games, coloring books, and the think happy thoughts game. Each video and game is centered around Wuf Shanti’s mantras, yoga poses, and meditations to promote health, wellness, and happiness, and encourage peace and positivity. 8. What Mom’s Choice, National Parenting Product Awards (NAPPA), and Common Sense Media Designations have Wuf Shanti been awarded? What honors has Adam been awarded? Wuf Shanti is a recipient of the prestigious Mom’s Choice Award and named among the “Best in Family-Friendly Media, Products, & Services.” NAPPA awarded Wuf Shanti the “Best Products for Kids” award in their Health and Wellness Roundup. 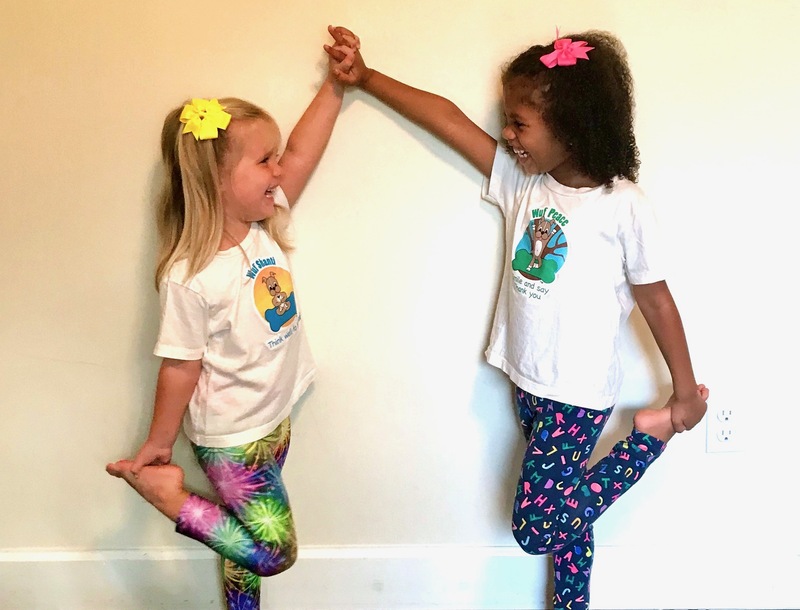 Common Sense Media named Wuf Shanti’s Mobile App, the Yoga Fun Machine, one of the “Best Health Apps and Games for Kids.” We are so honored and beyond grateful. 9. Are the shirts made in America? Our current inventory is, yes. We have a couple of styles that are not, and if that is the case, we will let you know in the shirt’s description. By the way, our books and pants were also made in America. *Please note that our shirts are manufactured by our friends at WeGo-Kids. They have the same great 100% organic cotton, designs and mantras, except they will be appliqued instead of screen printed, and made in India. The shirts are certified to meet or exceed the GOTS specification, dyed with AZO-free/heavy metal-free eco-friendly dyes, nickel free snaps to prevent allergic reaction, and available in both long sleeve and short sleeve. We are excited to embark upon this new adventure. For cleaning and safety information, please visit www.wego-kids.com. 10. Are the shirts organic? Yes, 100% organic cotton. The doggie shirts are 100% cotton; however, we are still looking for a supplier to make them organically. The women’s shirts have some bamboo, and we let you know that in the product’s description. 11. What are the sizing/washing instructions? We would suggest buying the next size up. Please make sure to hand wash or wash the t-shirts inside out with cold water on gentle cycle. Air dry or tumble dry low, and remove promptly when finished. We would not suggest ironing; however, if you feel you must iron, always do so from the back very lightly on low heat by passing over the design, and do not leave the iron on it for too long. Please make sure to read the product description for directions as to how to wash the pants. 12. Are the Stuffed Animals and Yoga Mats made in America? The stuffed animals are not made in America; however, they are ethically sourced and tested by the manufacturer. The yoga mats are sourced and embroidered by a domestic company, as are the stuffed animals. 13. What’s the shipping cost? Do you ship internationally? Shipping and handling costs depend on the size of the order and shipping location. Unfortunately, we do not ship overseas at this time. 14. Is there sales tax? Yes, the sales tax depends on your location. 15. How long will it take for my order to arrive? Please allow two to four weeks for delivery. If the item is on back-order, we will let you know. 16. What is the return policy? 17. What is the Kids’ Association for Mindfulness in Education? 18. What is the Mindful Kids Peace Summit? DAY 5 Social Emotional Learning (self-awareness, self-regulation, resilience, compassion, empathy), Interacting with Others, Positive Psychology: More Mindfulness for Kids, and how Teachers and Parents can help.